The Glen Cove Community Development Agency’s purpose is to plan and implement programs involving the rehabilitation and revitalization of both the residential and commercial sectors of the City of Glen Cove, foster economic growth, provide assistance to public service organizations, eliminate blight and improve opportunities for low and moderate income citizens of the City of Glen Cove. The Glen Cove Community Development Agency (“CDA”), formerly known as the Urban Renewal Agency, was established on April 16, 1964 under Title 11-A Section 580-a of the Consolidated Laws of the State of New York. The name change was mandated by State Law Section 580-a, in January 1, 1980. The CDA consists of the Mayor, who acts as Chairman and six board members appointed by the Mayor and approved by the City Council. 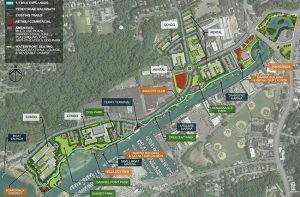 Waterfront Revitalization: The City of Glen Cove reached another milestone in the environmental remediation of the second to last Brownfield parcel along the City’s 56 acre Waterfront Revitalization Area formerly known as Gladsky Marine site. The site was among the most highly contaminated industrial areas in the State of New York as a result of a marina and marine repair facility along Glen Cove Creek which was in operation from the early 1970s until its closure in 1999. Now the site is ready for productive use thanks to the support and guidance of our New York State and Nassau County partners as well as the USEPA and NYS DEC regulatory agencies. The Glen Cove CDA offers a matching grant commercial rehabilitation program. The program offers facade improvements for storefronts in the downtown area. Commercial rehabilitation funds can include windows, doors, awnings and outdoor lighting. The program is offered on a first come/first serve basis. The Meritage Wine Bar and the Downtown Cafe are two projects that were assisted through the CDA’s Commercial Rehabilitation Program. The Glen Cove Community Development Agency (CDA), through an intermunicipal agreement with the City of Glen Cove, researches grant opportunities, writes and submits grant applications, and provides grant administration, including the Waterfront Redevelopment Project, on behalf of the City of Glen Cove. The CDA receives annual Community Development Block Grant funding, (“CDBG”) from the United States Department of Housing and Urban Development through the Nassau County Consortium. This CDBG grant funds the Residential Rehabilitation Program for senior citizen/disabled residents; public service agency programs that provide services for the benefit of low/moderate income residents of Glen Cove; public facilities improvements that serve an area benefit to the public such as handicap accessible doors to Glen Cove Sr. Center and Brain Games Room upgrades. Funding is also available for economic development programs such as commercial facade rehabilitation and signage grant programs to help business as well as leveraging funds for City projects that serve to eliminate blight and remediate contaminated sites.